The Big Data is the technical term which denotes the large volume of data. The volume is so large that it is not easy to copy or transfer such the volume. It is clear that the size of Big Data depends on the time when you are talking on the topic. For example, in 2013 we can say about big data after size around hundreds of TeraBytes (TB). 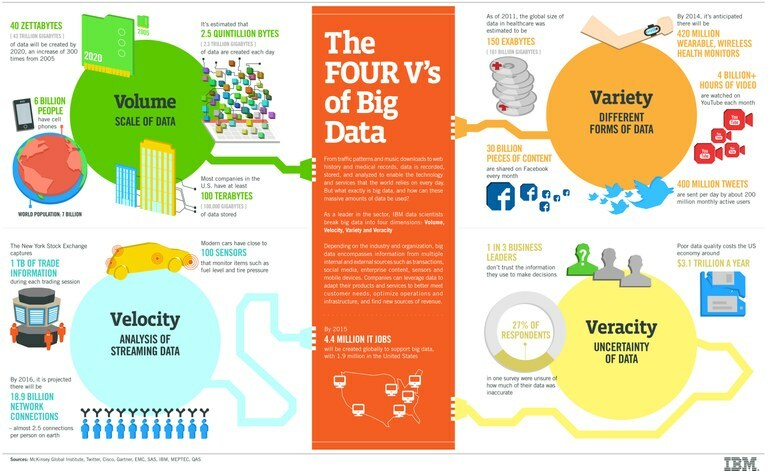 What are sources of Big Data? Many areas of human activity. We can remind experimantal data from High Energy Physics and Astrophysics, Genetics, Biology, etc. For example, you can take a look at the page [Information Revolution: Big Data Has Arrived at an Almost Unimaginable Scale]. For now we are planning to undertake comparative study of existing systems to copy/replicate Big Data over Internet and to develop the set of criteria to compare different systems of copying Big Data. Later on we plan to suggest architecture of copy/repicate system for Big Data for a range of application areas: communications, scientific physics experiments, etc. Welcome to the eduPERT Knowledge Base!!!! Large scale scientific data transfers are central to scientific processes. Data from large experimental facilities have to be moved to local institutions for analysis or often data needs to be moved between local clusters and large supercomputing centers. In this paper, we propose and evaluate a network overlay architecture to enable high-throughput, on-demand, coordinated data transfers over wide-area networks. Our work leverages Phoebus and On-demand Secure Circuits and Advance Reservation System (OSCARS) to provide high performance wide-area network connections. OSCARS enables dynamic provisioning of network paths with guaranteed bandwidth and Phoebus enables the coordination and effective utilization of the OSCARS network paths. Our evaluation shows that this approach leads to improved end-to-end data transfer throughput with minimal overheads. The achieved throughput using our overlay was limited only by the ability of the end hosts to sink the data. GridFTP - Grid/Globus data transfer tool. Client part is known as globus-url-copy.